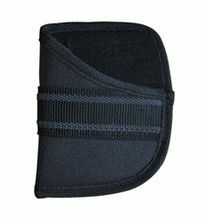 Designed for right handed users to disguise the outline of the gun while in the pocket and protect the gun from other items in the pocket. Keeps barrel from getting clogged with obstructions in pocket. Pouch is about 3.5 inches wide and 4.75 inches deep.